When traveling around the Yucatan peninsula it is common to ride a bus. You sit among the local people and yes, the stereotype is true, an occasional chicken or goat can be seen in the aisle. Stopping for the night means booking a room at the local posada, or inn. Simple accommodations, the posadas offer few amenities other than a hot meal, running water, and two eye bolts in the wall. If you know the best knots for hammock hanging you will have a comfortable night’s rest; if not, you will be on the floor. Hammocks have been in use throughout the world for centuries but their origin is thought to be Central and South America. When Spanish explorers first encountered these areas, the indigenous people were sleeping in hammocks of unique design according to the region in which they were made. Due to the inhospitable jungle environment of the area, staying dry and away from the possibility of insect bites was critical in the effort to avoid disease. Hammocks provided the perfect solution. Made of natural breathable materials, a bed slung between two trees ensured no snakes or biting bugs could attack during the night and allowed air to dry skin and clothing made damp by the jungle’s humidity. It didn’t take long for the popularity of these sleeping slings to become widespread. The free hanging design was perfectly suited to counteract the rolling of heavy seas. 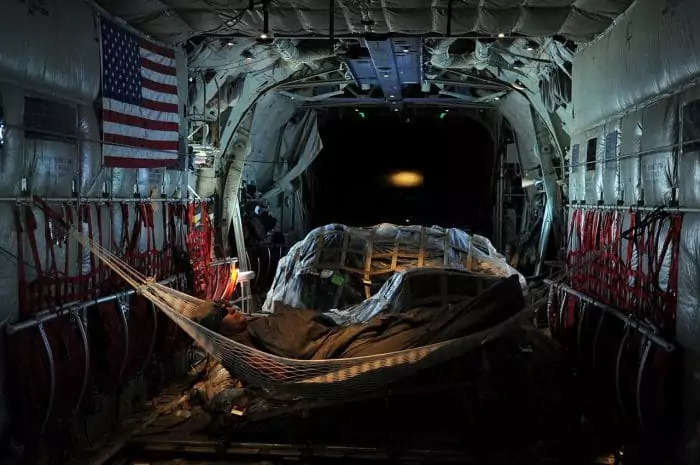 Soon, hammocks became standard sleeping quarters on the naval vessels and merchant ships of the day. Beyond fighting seasickness, hammocks were lightweight and extremely space saving when rolled up. Many fighting ships used their hammocks to strengthen defense against cannon fire by rolling them up and loading the outboard nets with thick canvas padding. Hammocks were used by modern military units when wars were fought in tropical terrain. The U.S. Marine Corps issued their version of the sleeping sling to troops during the Vietnam War. Unfortunately, their use of waterproof fabric was inferior to the Viet Cong’s breathable version, scavenged from recovered parachutes. Today, hammocks are still used in lieu of traditional beds in many parts of the world. Still the best defense against disease in the jungle, the styles and designs utilized have remained unchanged for centuries. Recently, hammocks have enjoyed a new life as backpackers and campers have discovered their value when looking for a lightweight and portable sleeping solution. All hammocks can be broken down into two categories. Inline slings use no spreader bars and form a tight cocoon around the occupant. Spreader-style hammocks incorporate at least two spreaders to create a platform. The spreaders can be made of any material but most commonly are fashioned from wood. 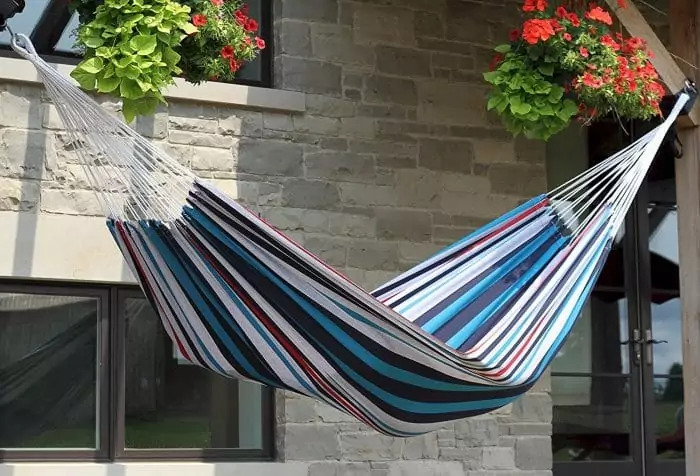 There are eight accepted styles of hammock still in use. All are unique and are designed to serve specific purposes. An inline design, Brazilian hammocks are made from thick woven cotton fabrics instead of string or rope. The weight of the sling gives warmth to the occupant and more support than other varieties. However, the material does not breathe well which can have an impact in especially damp climates. There is no evidence the inline hammocks of the Yucatan Peninsula were used by Mayans. But they definitely were being hung before the Spanish arrived. The Mayan style is created with thin brightly colored string and normally lacks fringe or other embellishments. This style is similar to the Brazilian design but includes spreaders. Made from tightly woven string, these hammocks are known for their decorative fringe and supportive double weave. Nicaraguan hammocks are renowned for their comfort and durability. As the name suggests, this style is made from rope instead of fabric or woven string. The rope is knotted to form a net and can utilize a spreader or be inline in form. This is not the most comfortable style but is certainly a durable option. These hammocks are commonly found in backyards, with or without a pool. Made from wide fabric panels and utilizing substantial spreaders, these tend to be comfortable but not very portable. Options for the lounger include widths suitable for multiple people and stands to suspend the hammock without posts or trees. 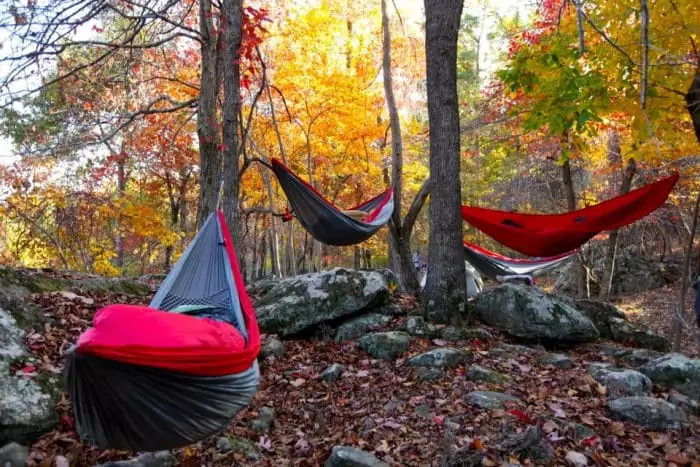 Inline hammocks made from breathable and durable materials are becoming the sleeping option of choice for many backpackers and hikers across the world. Taking up very little room in a pack and weighing next to nothing, many outdoor enthusiasts are leaving the tent at home and packing a hammock instead. Popular in South India, baby hammocks are used by parents to provide infants and toddlers a comfortable place to sleep. The practice spread to many western countries before fears of detrimental impact on breathing curtailed the spread sharply. Regardless of the type of hammock you own, it is still necessary to know how to hang up a hammock if you are to enjoy its benefits. In just three easy steps you can have your bed for the night suspended off the ground and ready for your sleeping bag or blanket. The first thing you need is two sturdy trees, stout posts, or a stand with enough distance between eyelets to extend the hammock fully. This measurement is called the span and is critical to your success. It is best if you measure this distance in advance of any trip. It will be different depending on your individual sling. When you have the preferred span measured in advance, it will be far easier to locate the perfect trees without unraveling your sleeping gear every time you come across a likely hanging site. Carefully unroll your hammock, taking care to clear any tangles or knots in the lines. Lay the hammock flat on the ground in between your two tie-off points. Starting at either end, fasten the lead line to one post or tree, fastening it securely at eye level. Then, take the other line and fasten it to the opposite tree at the same height, taking up slack until the lines are descending at about 30 degrees from each tree. This angle will provide stability but also make the platform assume a comfortable sleeping position. There are many different techniques used when fastening hammocks to a tree or post. One of the benefits of using this method to sleep in the wild is its low impact on the environment. But that benefit is negated if your rope gouges the bark of the tree you are tied off to. A device called a tree strap is readily available in most outdoor stores. A tree strap is a wide fabric belt designed to leave the tree bark intact. A carabiner is attached to the belt for connecting with your lead line, making installation easy. In the absence of a tree strap, placing a blanket or shirt between the rope and the tree will help keep the bark from being injured. If no cushion is available, try to space your loops around the tree several inches apart to disperse the load evenly. Hammock hangers primarily use three knots. All are common and easy to learn. Best of all, they are all simple to untie the next morning. Tying a bowline around one tree gives you a dependable fixed end which will hold a tremendous amount of weight. If you are not using a tree strap, modify a standard bowline by wrapping it several times around the tree trunk before tying off. To tie a bowline, take the end of the rope in your right hand and the running line in your left. Form one overhand loop. Pass the end in your right hand through the loop. Encircle the tree 2-3 times and then pass the end down through the original loop. Going under the running line come back up through the loop and pull tight. See our other article on top knots to use to tie your hammock to find out more. A suitable replacement for the bowline on the fixed end, a backpacker hitch develops more friction but the knot itself isn’t as strong. This is a good choice for especially smooth barked trees or hard posts. Wrap your line at least three times tightly around the tree. Then, wrap twice more but loosely this time, keeping about an inch of slack in each loop. Create a bend with the end of the rope and tuck it under the loose loops you have left for this purpose. Pull to tighten. To release, pull the end of the line and your knot should unravel freely. Now that you have one fixed end you will need a knot that can be adjusted to take up slack. The taut line hitch is perfect for this purpose. It also makes a great tent stake knot and is sometimes called by that name. Loop your rope several times around the tree. Take the end and wrap three times around the line that originally went around the tree. To lock the knot, make one last loop around the same line but under the other loops and pass the end through this new loop, creating an overhand knot. Pull tightly. It should be noted that the taut line hitch is best for light line and will be undependable under heavy loads. If you are planning on putting stress on your hammock, it is best to tie a bowline at each end, working the knot through to take up any slack. Many people add extra support to their sleeping slings in the form of ridgelines. It is not mandatory for proper set-up but it will add some rigidity to the hammock if needed. Ridgelines are simply a length of line connecting the two ends of the hammock. This fixed line keeps the platform at a consistent sag and some claim the sleeping experience is more comfortable. Adding the line is easy, measure the distance and connect the line using a bowline on either end. Ridgelines are nice because every sleeper has their preferred amount of sag in the platform. Once you find yours, tying a ridgeline will ensure the hammock feels the same way every time you hang it up. Bad Knots can hurt you. Only tie a hammock to a tree as high as you are comfortable falling. Murphy’s law says that you are eventually going to hit the ground if you sleep in enough hammocks. That said, practice your knots and don’t ever rely on a knot unless you absolutely know it is tied correctly. Choose your trees wisely. Do not tie off to a dead or damaged tree. Crashing to the ground in the middle of the night is bad enough, but when the tree falls on top of you your trip is definitely ruined. Clear the area under your hammock. If possible, prepare for the inevitable by choosing your ground wisely. Clear large sharp rocks and branches in case you fall during the night. Check for level before you hang your hammock. If the ground is uneven, adjust the height of your line on one tree to make your bed level. This makes all the difference in the world. If you sag too much no matter how tight you tie your ridgeline, try sleeping diagonally. This will take some of the sag out and make it easier to get in and out. Always bring a tarp. The ridgeline makes for a perfect A-frame when draped and four taut line hitches tied to stakes will seal you off from the weather. Just because you are swinging from the trees doesn’t mean you can’t be dry. Also see our article review of the best hammocks to give you more choices. Hammocks have been a preferred sleeping method for centuries because they work. They keep you up off the cold ground, make it harder for snakes and insects to get at you,and they are light and compact in your bag. If you haven’t tried sleeping in the trees yet, give it a shot. At the very least you will have an interesting story to tell and you might like it so much you throw your tent out the next day. Check out out top list of ultralight hammock for your reference. Do you have a favorite method to tie off your hammock? How about a story about hammock camping in the woods? If you do, use the comments section to tell our readers and us all about it.